Nations around the world are abandoning nuclear energy in the wake of the Fukushima nuclear crisis, however the UK is considering plans to launch a new generation of reactors by GE Hitachi that recycle nuclear waste into energy-generating fuel. According to the Department of Energy and Climate Change (DECC), these new reactors have the capability to consume Britain’s massive radioactive waste stockpile while generating enough low-carbon electricity to power the country for more than 500 years. 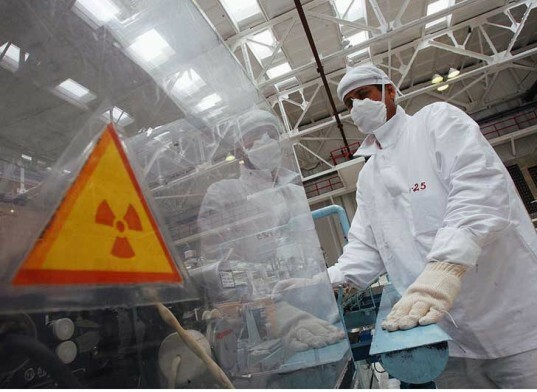 Britain has been evaluating various options on how to handle its stockpile of nuclear waste, which includes more than 100 tons of plutonium and 35,000 tons of depleted uranium. The plutonium in particular presents an especially high security risk that would cost the country billions of pounds to dispose of. Thus far, to remedy the problem, the DECC has only proposed building a plant to combine the plutonium with other materials to create a less volatile mixed-oxide fuel. However, the resulting fuel allows only a tiny proportion of the energy in the waste to be converted into electricity. As a counter proposal, GE Hitachi submitted their design for a new reactor based on their existing Prism design. The new reactor would be able to consume the plutonium and generate around 311 MW of power (equal to a quarter of a conventional plant). The reactor core would be cooled in a pool of liquid sodium, transferring the heat to turbines where electricity is generated. It is reported that if enough reactors can be constructed to consume the country’s existing nuclear waste, they could produce enough low-carbon electricity to supply the UK at current rates of demand for more than 500 years. Cost of construction and running the facilities still remain points of concern, as does licensing requirements, but Eric Loewen, chief engineer at GE Hitachi nuclear, claims that the technology should be economically competitive due to its small and fixed-size and factory-made modular design. Currently, GE Hitachi is in discussion with DECC on the commercial viability of the project. Sodium cooled solid fueled reactors is one option. But sodium reacts "energetically" with water; the Monju reactor was destroyed by a pipe leak. http://en.wikipedia.org/wiki/Monju_Nuclear_Power_Plant Liquid fueled, molten salt reactors also can consume nuclear waste. But they fission over 99% of the fuel, circulating the fuel through the reactor core and extracting fission byproducts. Liquid Fluoride Thorium Reactors (LFTR) have inherent safety, including: - the coolant remains liquid ~500 degrees C above the reactor temperature (700-1000 degrees vs 1400 degrees), so the reactor operates at atmospheric pressure (no high pressure to explode) - the coolant is chemically stable (no explosions), doesn't react with air or water - the coolant is chemically bonded to the fuel, so loss of coolant accidents are impossible. Also, radiation leakage to the environment is greatly reduced, both in probability and amount. - the rate of fission slows as the molten fuel expands from heat, or increases as the molten fuel cools, very stable They have passive safety, including: - melt a frozen plug in a pipe, and the fuel drains quickly to passive cooling tanks where nuclear reaction is impossible My blog covers design, safety, nuclear waste, economics, development and testing to be done, proliferation, how LFTRs would fare in accidents or attacks. Technical journals and engineers I used as sources are referenced, especially http://energyfromthorium.com/ See http://liquidfluoridethoriumreactor.glerner.com/ and ask questions or leave comments. Should that first sentence say that "Nations around the world are abandoning nuclear energy...?" So far no country with operating nuclear reactors has actually shut them down and replaced them with something better. Germany has turned a few off but then they also plan to build new coal plants, which is hardly a step forward and debatable as to whether it is actually worse. The opening sentence just seems a bit coercive. Nations around the world are abandoning nuclear energy in the wake of the Fukushima nuclear crisis, however the UK is considering plans to launch a new generation of reactors by GE Hitachi that recycle nuclear waste into energy-generating fuel. According to the Department of Energy and Climate Change (DECC), these new reactors have the capability to consume Britain's massive radioactive waste stockpile while generating enough low-carbon electricity to power the country for more than 500 years.